Watch our brief (2:39) intro showing you how easy it is to add fluorescence to virtually any existing stereo microscope in about 30 seconds. Are you entering your first faculty position in academic year fall 2018 – fall 2019 or do you know someone who is? Read about the annual KEY Award for New Faculty. 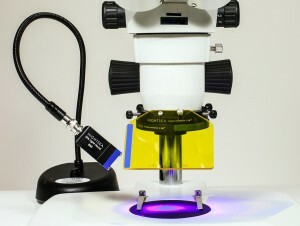 The recipient is granted a NIGHTSEA Fluorescence Adapter system with two excitation/emission combinations plus $750 in supplies from the Electron Microscopy Sciences (EMS) catalog! The Model SFA Stereo Microscope Fluorescence Adapter is a complete solution for adding fluorescence to existing stereo microscopes. It includes everything you need for adapting (not converting) just about any stereo microscope. You can purchase any of the 6 modular wavelength combinations that you need now and add more at any time. And best of all – it’s just $1,095 to get started with the complete setup for one color. You only need the first group one time. Wavelength combinations are supplied in a light + filter set consisting of a light head, barrier filter, and viewing shield in a custom foam-lined box. The light head and filters can be removed and replaced in seconds, and color coding ensures that you are using the right combination. All components are also available a la carte. Interested in how this product came into existence? Read the origin story. Uncertain what to use? Refer to our comprehensive table of fluorophores and recommended NIGHTSEA wavelength sets. With the Royal Blue (RB) excitation we offer two barrier filters – longpass and bandpass. Read our article on selecting the right passband option for your application.